Have you ever wondered how WordPress plugins affect your site’s load time? WordPress plugins allow you to add features to your site, but they can also affect your website speed. In this article, we will show you how WordPress plugins affect your site’s load time, and how you can control them more efficiently. WordPress plugins are like apps for your WordPress site. You can install them to add more features to your website like contact forms, photo galleries, or an ecommerce store. When someone visits your website, WordPress first loads its core files and then loads all your active plugins. For more details, take a look at our article about what are WordPress plugins? And how do they work?. How Can Plugins Affect Site Load Time? However, if you are using multiple plugins that are making too many http requests to load files and assets, then it will affect your site’s performance and user experience. How to Check Files Loaded by WordPress Plugins? To see how plugins are affecting your page load time, you need to check the files loaded by WordPress plugins. You can also use third-party tools like Pingdom and GTmetrix to see this. Among other useful information, these tools will also show you all files that are loaded and how much time they took to load. As you see these files being loaded, you may start wondering how many plugins you should I use on my site? How many plugins are too many? The answer really depends on the set of plugins you are using on your website. A single bad plugin can load 12 files while multiple good plugins will add just a couple of extra files. All well-coded plugins try to keep the files they load to a minimum. However, not all plugin developers are that careful. Some plugins will load files on every single page load, even when they don’t need those files. If you are using too many of such plugins, then this will start affecting your site’s performance. How to Keep Plugins in Control? The most important thing you can do on your WordPress site is to only use plugins that are well coded, have good reviews, and are recommended by trusted sources. See our guide on how to find which WordPress plugins. If you find that a WordPress plugin is affecting your site’s load, then look for a better plugin that does the same job but better. Another factor you should consider is your website hosting. If your hosting servers are not properly optimized, then it will increase your site’s response time. This means that not just plugins, but your site’s overall performance will be slower. Make sure you are using one of the best WordPress hosting companies. As a last resort, you can uninstall plugins that you can live without. Carefully review the installed plugins on your website,and see if you can uninstall some of them. This is not an ideal solution as you will have to compromise on features for speed. Advanced WordPress users can try to manage how WordPress plugins load files on their site. Doing so requires some knowledge of coding and some debugging skills. The proper way to load scripts and stylesheets in WordPress is by using the wp_enqueue_style and wp_enqueue_script functions. Most WordPress plugin developers use them to load plugin files. WordPress also comes with easy functions to deregister those scripts and stylesheets. This way you will be able to load all of them at once, minimizing the http requests and effectively decreasing your page load time. First, you will need to find the name or handle of the stylesheet that you want to deregister. You can locate it using your browser’s inspect tool. After finding the stylesheet handle, you can deregister it by adding this code to your theme’s functions.php file or a site-specific plugin. Remember, that deregistering these stylesheets will affect plugin features on your website. 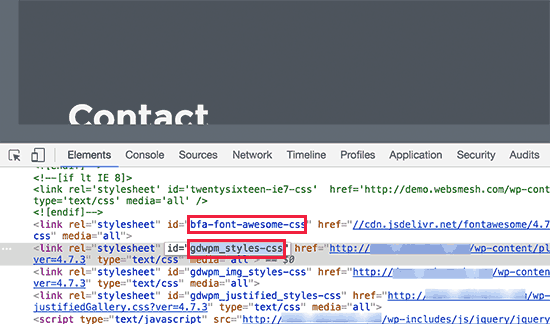 You need to copy the contents of each stylesheet you deregister and paste them in your WordPress theme’s stylesheet or add them as custom CSS. For that you will need to dig deeper into plugin files to find out the handle used by the plugin to load a script. Another way to find out all the handles used by plugins is to add this code into your theme’s functions.php file. After adding this code, you can use [pluginhandles] shortcode to display a list of plugin script handles. Now, as we mentioned earlier that disabling these scripts will stop your plugins to work properly. The best place to test is on a local WordPress install or on a staging site with managed WordPress hosting providers. If you know that you will be needing a plugin script to load on a specific page on your website, then you can allow a plugin on that particular page. This way the script remains disabled on all other pages of your site and is loaded only when needed. 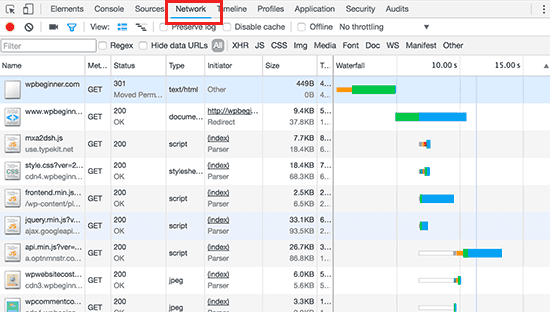 Here is how you can load scripts on specific pages. This code simply disables contact-form-7 script on all pages except the contact page. We hope this article helped you learn how WordPress plugins affect your site’s load time. You may also want to see our ultimate guide to improve WordPress speed and site performance. Question re: deregistering plugin stylesheets and scripts and merging them into a single stylesheet and a single script file respectively, will you have to do this every time there is a plugin update? If so, is there a way to get around this? I use a couple of plugins when writing copy. (Font, etc) If I deactivate when I’m not using them will it help? So, how would I add a Code Pen script to a page if it’s just a CSS only pen? And also, how would I add pens with JS, please? also you can remove some languages of the plugin.so delet .po and .mo files(if they are not usable) can load you faster.and remove helps files and pictures and you can minify your js and css(not necessary) and some more…. Thanks for the tips @Wpbeginner. I love you guys! Could you please make a list of top social media share buttons for WP? For example what are you using on your website to do that, plugin, Shareaholic or SumoMe? Or something made yourself?